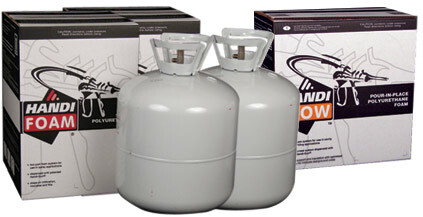 Handi-Foam polyurethane spray foam insulation kits. Self contained… Recyclable… Easy to use. Top Quality 2 Component disposable low pressure polyurethane foam insulation kits. All kits come complete, factory assembled, and ready to use. Handi-Foam Contains NO Penta-BDEs, CFCs, VOCs or Formaldehyde! FomoFoam and Commercial Thermal Solutions, Inc. is an independently operated and owned distributor of Handi-Foam and its related products. These products are intended for professional use only.